Mounting: A 2-1/2” diameter supporting ring provides the method of hang- ing the scale mechanism freely in space. Adjustment: Fill the plastic bucket to the spill holes with clear water. The bucket spill holes are located so that slightly more than 1000 cc will be contained. Fill the bottom of slot to proper level to permit spillage at 1000 cc. Hang this on the scale hook, turn the zero adjustment screw found directly above the scale hook until the scale pointer is vertical, reading 1.000 on the outer ring of the dial. The scale is now calibrated. Determining the Specific Gravity of Dry Solids: The innermost circle marked for determining the specific gravity of dry solids is used for this purpose. A sample of material for determination should be dry and pref- erably all -10 mesh, +100 mesh. Hang the dry empty bucket on the pulp density scale; then pour in the sample of dry material until the pointer indicates 1000 grams (1.000 kilograms) on the outer circle of the dial. At this point the bucket will contain one kilogram of dry material. Dump the sample material onto a rolling cloth or paper sheet. Fill the bucket about 1/3 with clear water. Pour the sample slowly into the bucket, making sure that all material is thoroughly wetted, and all air bubbles are eliminated. After the material has been pulped in this fashion, add clear water until the bucket is filled to the overflow level. Hang the bucket on the scale and read the specific gravity of the dry solids directly on the innermost circle of the dial. Taking a Sample: Fill the plastic bucket with pulp or liquid requiring measurement. The liquid level should reach the spill holes in the bucket. Any spill on the outside of the bucket should be washed off. 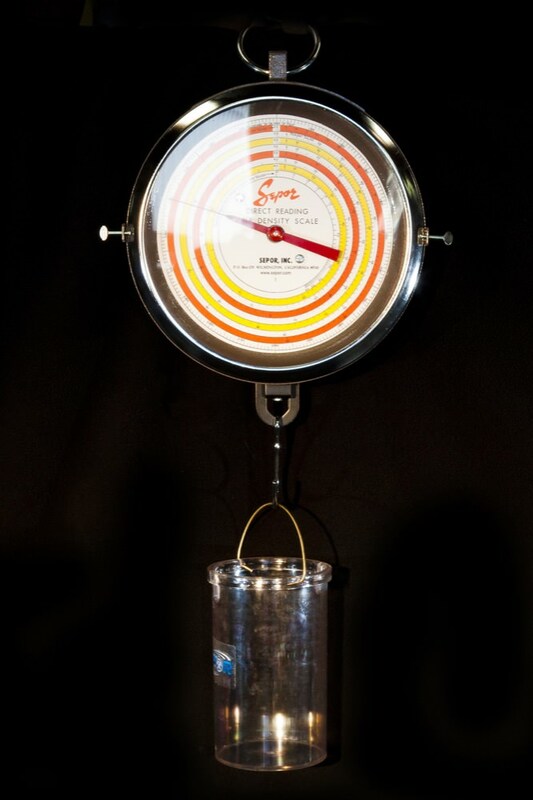 Hang the bucket on the scale and determine the specific gravity or percent of solids. Determining Specific Gravity of Pulp: To obtain this measurement, hang the filled bucket on scale and read directly on the outer white ring where pointer stops. Determining Percent Solids: Hang filled bucket on scale. 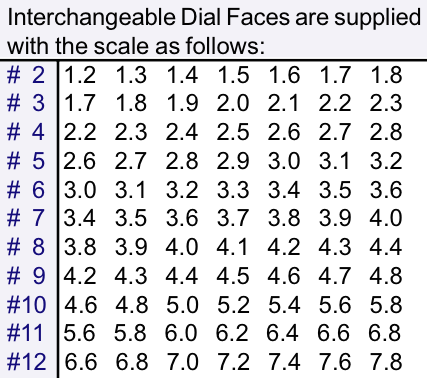 Select the correct dial ring for the specific gravity of dry solids of your material. For example, the specific gravity of dry solids of your material is 2.2 at the center vertical column showing specific gravity of dry solids, 2.2 is the outer red ring, you would read the percent solids as being 44. At 2.6 specific gravity which is the next inner ring, the percent solids is 39, for 2.8 specific gravity the reading is 37.25%, at 3.2 specific gravity the reading is 35%, at 3.6: 33%, 4.0: 32% and at 4.4 the reading is 31%. 1. Remove the scale, laying it flat on a table. 2. Loosen the thumbscrews on the sides of the scale and lift off the clear cover and retaining ring. 3. Remove the two screws and washers near the center of the dial. Do not remove or bend the pointer. 4. With pointer pointing directly at your body, take the selected dial in both hands with the split in the dial directly above the pointer. Depress the right side of the split dial beneath the pointer, then rotate dial 270° clockwise. This then places the dial beneath the pointer. turn dial to correct position lining-up with the two screw holes and the four positioning marks on the outer rim of the dial. 5. Replace the two screws and washers. Replace the glass cover plate and retaining ring, tighten thumbscrews. CAUTION: The scale has been factory set. Do not remove the back cover plate of the scale or change any internal adjustment. The scale has been constructed for trouble-free operation and will provide accurate measurement if the mechanism is not altered. Pulp density scales are accurate to +/- 10 g.